Ask fellow campers about "The Byrd's Nest RV Park" and nearby attractions. Nice fish camp setup on Toledo Bend. Owners are friendly and helpful. We camped at The Byrd's Nest RV Park in a Motorhome. This is a great stop if you are looking for a forest setting. The sites are grass and mostly level. I chose a back-in spot that was roomy. Joe was great. He met us upon arrival, showed us to our spot and helped me park. The Canada geese, pet geese and pet guineas provide scenic wildlife. Great place to launch your boat and fish on the lake. We camped at The Byrd's Nest RV Park in a Fifth Wheel. We were about 75 minutes from Lufkin. There is a big-rig friendly convenience store with diesel a couple of miles away. Great place for fishing, boating, or just relaxing. We rented a cabin and it was a perfect escape with our family. Very clean park with everything you need to enjoy time together. The owner is great and such a friendly host!!!! We will be back soon! We camped at The Byrd's Nest RV Park in a Cabin. Good place to stay for fishing. Lots of shade, my dish would not work because of the trees. I would look for another place if in area. Sites are very close, pointing in all directions. I was six feet away from a trailer. Owners live there, friendly and helpful. We camped at The Byrd's Nest RV Park in a Motorhome. This is a delightful, shady place to stay. The owners live on-site and are friendly and helpful. It's located on Toledo Bend lake and has a boat ramp too. We had wonderful breezes and a nice view of water, trees, and wildlife. There is a dog-walking field (must keep your dog on a leash). There is also a little store and restaurant in front on the highway. They also rent cabins. We camped at The Byrd's Nest RV Park in a Travel Trailer. 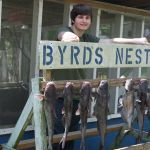 Are you affiliated with The Byrd's Nest RV Park ?